Maybe I should do a new year's resolution to post double digits worth of these in the 2019. Here's the century mark, numbering-wise. UD didn't do like Topps with having notable players in the double zero spots, but things worked out nicely here. Better photo? : It was strange that the slugger got a fielding and running photo on his card. 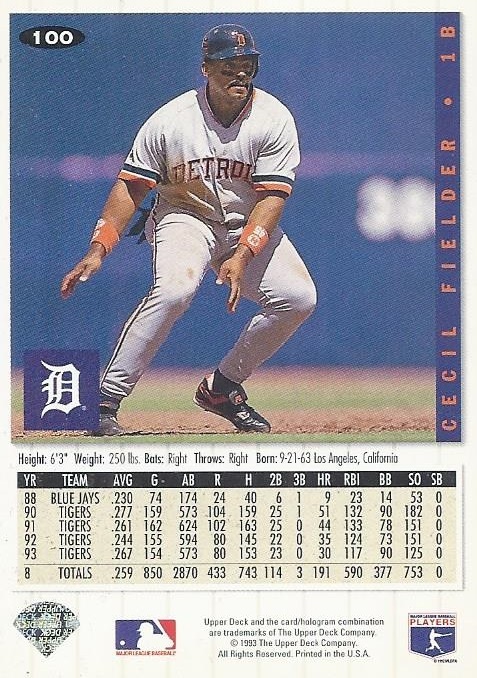 I guess I'll give it to the front with the fielding for fielder. Ties to my personal collections: Former Toronto Blue Jay. 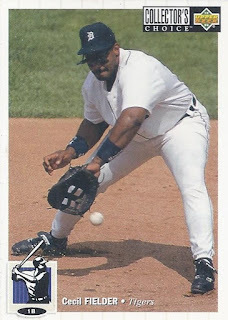 Wiki-facts: He is the father of Prince Fielder...the first father and son to both have 50 home run seasons in MLB. Google it: 2 of the entries on the first page are devoted to Prince. How was his strike shortened 1994? 28 HR and 90 RBI with a .259 average. Birthday boy: September 21, 1963. 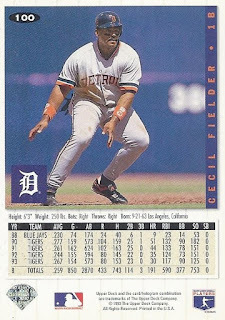 That's also the birthday of the man who lead off 1991's Fleer release - Troy Afenir. Also born on the date was NHL journeyman Troy Loney.